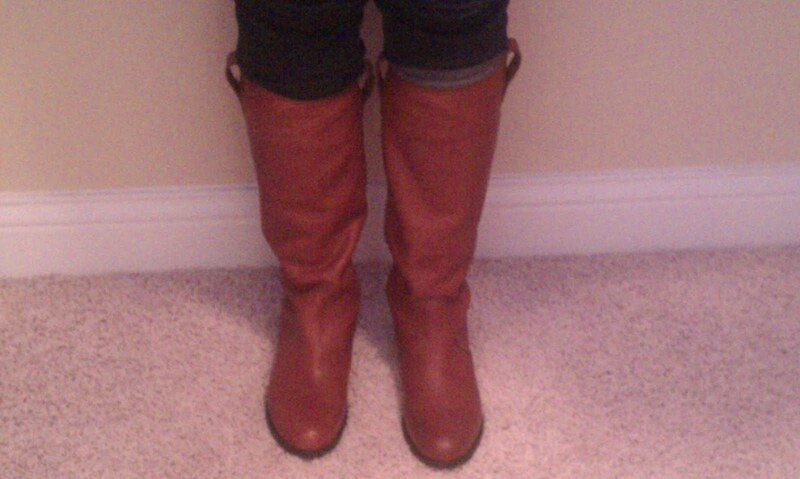 Madewell’s Archive Leather Boots have been on my wishlist for a month. Unfortunately, we don’t have a Madewell in our mall. So, my wonderful hubby agreed to take me on a day trip to Easton Mall in Columbus, Ohio this past Saturday. 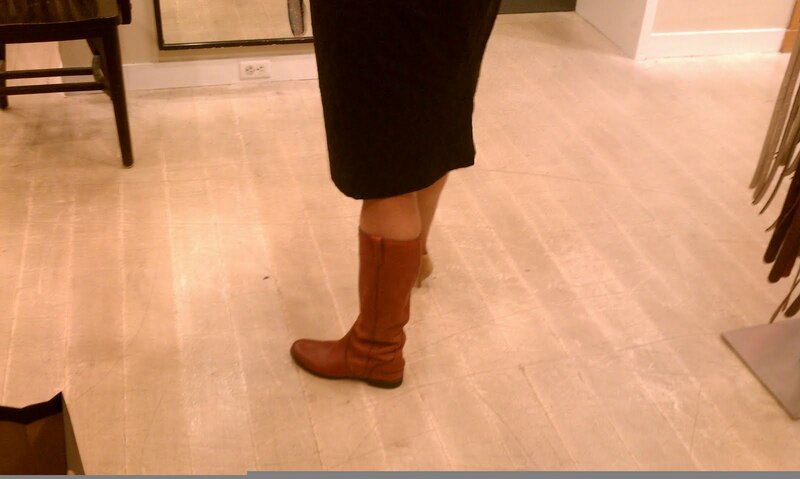 I love the color of the Archive boots, but I’m concerned about how they fit me. 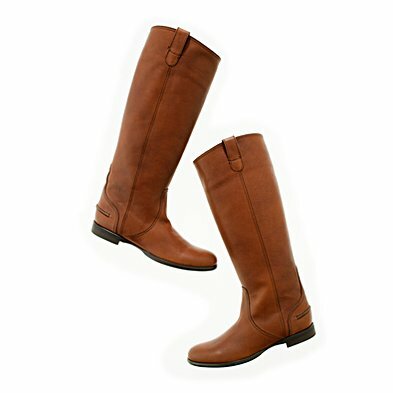 The SA’s gave mixed opinions–one said that the boots should have a slouchy fit; the other said they shouldn’t be slouchy. Hmmmm, okay. Here are a few pics. Excuse the first one of me wearing one boot! Sorry, we had just left church the day after our trip and my wonderful hubby was starving. We made a quick stop by J. Crew before dinner to show the boots to my PS. This is the downside of not having a Madewell (and a bunch of other stores) in our mall. Here are a few more pics. 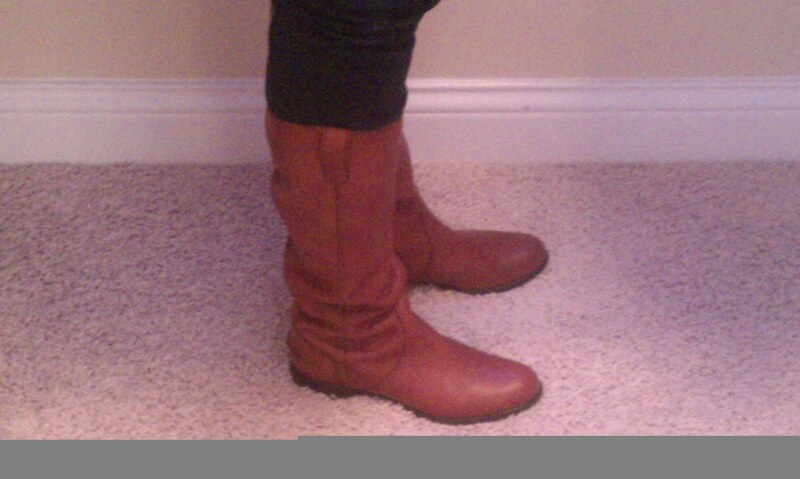 I’m concerned that these boots are too slouchy on me. What do you think? J. Crew has been my favorite clothing store since I was in graduate school. I still remember my first purchase. My favorite purchase ever, hands down, is the Bella Jacket. I love the bella so much that I bought it in four different colors: black, camel, dark charcoal, and a deep orange (I can’t remember the actual name of the color). I’ve been haunted, however, by my failure to purchase the bella jacket in neon azalea. I should note that I also have a factory version of this jacket in a berry color. Dear readers, just look at this gorgeous color! I search Ebay constantly in the hopes that I will find the one that got away! And, I am not the only J.Crew fan who loves this wonderful jacket. Check out Alexis’s post about the bella jacket on the wonderful Mothership, J. Crew Aficionada, here. What, dear readers, is the one that got away from you? Do tell! Today is my birthday (yay! ), so I thought I’d create a post about my current wishlist and recent purchases. I’ll start with the recent purchases. I really like the fit/colors of the Eden Cardigan, so I grabbed the Heather Dark Grape and Bright Dahlia. This sweater is super comfy and versatile; it’s currently 30% off! I’m also loving the Boy Shirt in Stripe Crepe de Chine. Initially, I overlooked this shirt because I have both the Elodie and Blythe blouses. 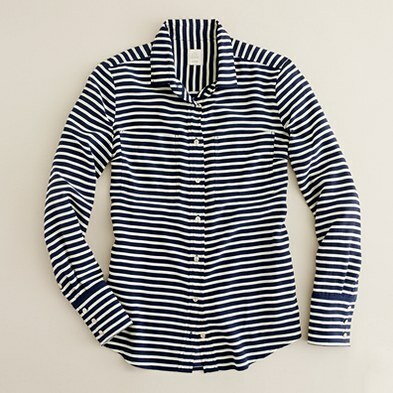 After trying on the navy version of the Boy Shirt in Stripe Crepe de Chine, I couldn’t pass on it. And, I’m a sucker for stripes! I’m really looking forward to wearing this blouse with a bright pencil skirt such as the No. 2 Pencil Skirt in Double-Serge Wool in Vibrant Flame. Finally, I grabbed the following three blouses: the Natasha top in polka-dot and Vivid Poppy, as well as the Silk polka-dot tee. I think the Natasha tops have endless styling possibilities. 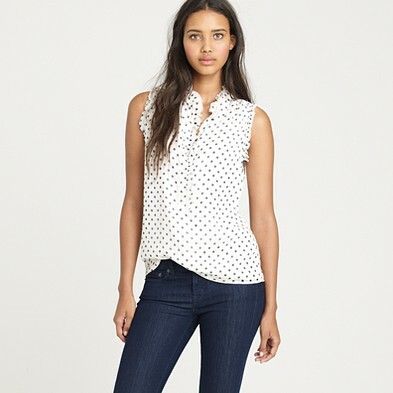 I intend to wear the polka-dot version of the Natasha top with bright pencil skirts as well. I just love the feminine details of this top. See it on Rose of the wonderful 1 More Shopping Blog. I LOVE how she pairs it with the No. 2 pencil skirt in Vintage Tweed in blush, which I also own. My final two wishlist items are non-j.crew. I am a sucker for bright colors and classy collars. 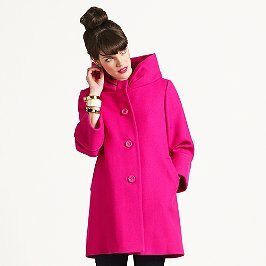 So, I am all over the Cherie Coat from Kate Spade. This color is absolutely beautiful!!! And, finally, I have my eyes on the Colorblocked Sweater Skirt in Blue at Anthropologie. What are you currently eyeing? I stopped by my B & M today to try on a few of the new arrivals. I just couldn’t give up on the Hacking Jacket in tipped double serge-wool. Boy, oh boy, am I glad that I didn’t. I LOVE the black. 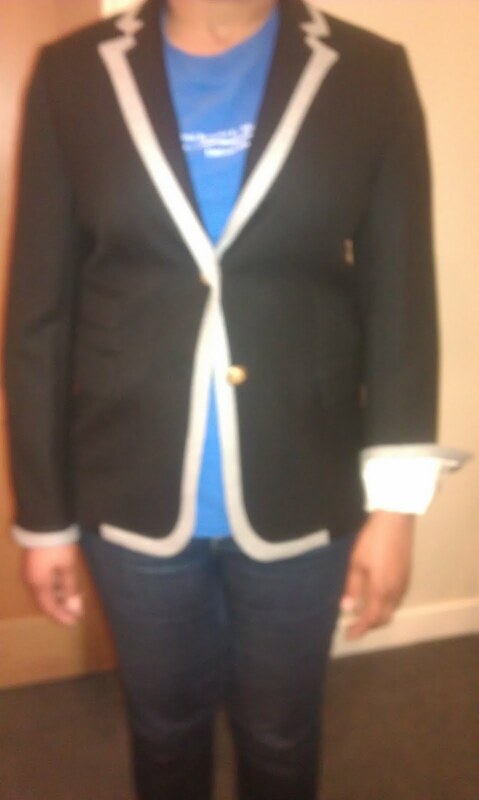 And, since I missed out on the Lexington Blazer, I just couldn’t pass on this one. I really like the product shot on the website. I can think of several outfit combinations. Here’s a really grainy fitting room pic (excuse the t-shirt!). Sorry for the bad image. What do you think of this version of the Hacking jacket? What new arrivals are you currently craving?